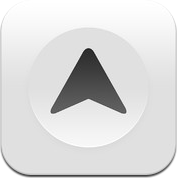 Two weeks ago, I received an invite to the beta of Lift, a new iPhone app for goal tracking and changing habits. There’s no shortage of apps that promise that, with their use, you can achieve any goal. I’ve tried Streaks, Ritual for the iPhone, as well as Joe’s Goals on the web, and a few others with various levels of permeability, and intrusiveness. Lift is among the least intrusive of the various apps I’ve tried, and yet in the last two weeks—though mostly in the last week—it’s been working well. The final release hit the App Store a few days ago, so let’s take a look. With any application of this sort, there is an easy temptation to load it up all at once with all the little things you want to change about yourself. Having made that mistake before, I settled on starting with only three habits: floss, write in my journal, and work on my secret project. (I will not tell you what my secret project is. It’s secret!) 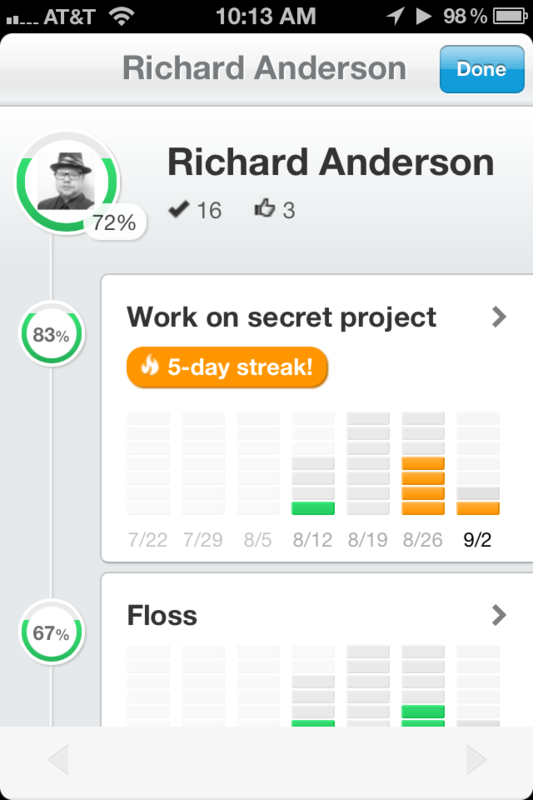 When I tried Lift in beta, the habit list was already populated with a number of habits to try. It’s not clear how to add new habits that aren’t in the list. Typing your new habit in the search field allows you to create it, and new habits are added to the global list for others to start tracking. You may find you’re not the only person out there trying to do an three hours of underwater basket weaving per day. There is no way to re-order the habits in this list, which is both a good and bad thing. It reduces the time you can spend fiddling, but if one habit is less of a concern than the others, you can’t shove it down the list. 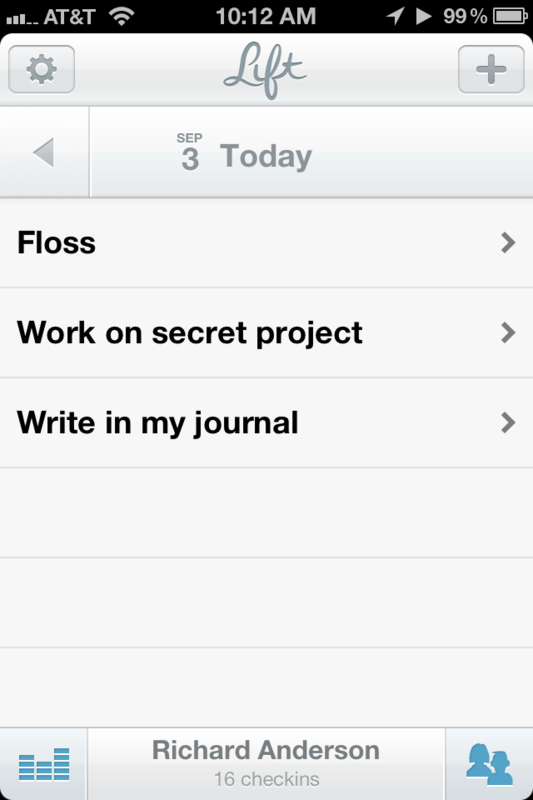 All your habits appear in a list on the application’s main screen. Tap one, and you see a big button with a checkmark, and a little chart of the frequency of your checks per week for the last five weeks. 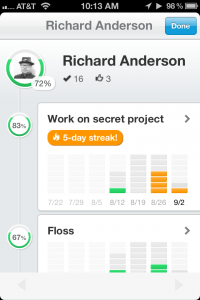 Below that, there’s a list of the checkins of other people working on the same habit. If you so choose, you can scroll through and tap a little “thumbs up” icon and give “props” to your fellow self-improvers. Checking in adds you to the list, and the “thumbs up” icon is replaced by a pencil icon, to let you write a quick note on your check in. The “props” feature is nice, though I don’t use it much. As for writing notes on your checkins, it took me a few pokes in the app to discover the feature. I don’t think the global list is the best place for that icon, but that’s a minor issue. On the main screen, at the bottom-left is a button that allows you to see your stats for your various habits over the last seven weeks. 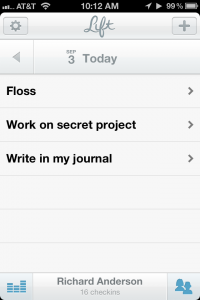 Tapping any habit gives you a more detailed view, with options for a calendar and reviewing your notes. It’s not a feature I use very much, but then again, I’ve only been actively using Lift for about a week, which doesn’t give me much data to display. Everything is represented in a very attractive way, however, and I look forward to the day when I will have a lot of stuff in there to look over. Lift also lets you look at your habit statistics through a beautiful web interface, but actual checkins have to be done with the app. This is not a shortcoming. I mentioned before about “alert fatigue”, and so Lift’s lack of alerts comes as a refreshing relief. Lift makes you come to it, and that forces the user to have a certain degree of mindfulness that more aggressive applications don’t cultivate. I’m more inclined to blithely ignore a notification to review my day and check in if it pops up in the middle of my winding down period at night. Lift’s attractiveness and user-friendly interface compels me to use it in a way that a number of previous applications have decidedly not. It’s been said that the more people you have supporting you in a life change, the better your chances of succeeding. Lift allows you to tie it in with Twitter through the built in iOS 5 Twitter integration, and with Facebook. However, the social features are limited to just pulling in your profile pictures. Lift does not tweet or update Facebook statuses. You can invite friends to use the app, but it doesn’t pull contact information in from any of your social networks, or even the iOS Address Book. I approve entirely of this. Personally, I do not like application posting to my Twitter or Facebook accounts, unless I explicitly tell it to. Props to Lift for keeping things private. Hopefully it’ll stay this way in later updates. Thankfully, you do get the support of all the people using the app, stranger and friend alike. Lift suffers from the same potential pitfall that all of the other applications in this genre suffer from: the human factor. While it’s the prettiest, and most frictionless of these applications I’ve tried, it does me no good if I neglect it. It has made its way from my second home screen to my primary one, and I’ve been launching it daily before I wrap up for the evening. What worries me is that, one day, the novelty of the application will wear off and I’ll be back where I was before. This is a problem with me, not with Lift, and hopefully I can overcome it. I do feel really good about Lift helping to keep me mindful, however, in a way that none of the other applications I’ve tried have. Another point of concern is that Lift is a free app, and I wonder how they plan to keep it going and make money if it succeeds. For something this attractive, I would have happily spent anywhere from $.99 to $2.99, and given serious consideration to spending up to $4.99. If Lift went the ad-supported route, I’d probably keep using it, but I can’t imagine ads being integrated well into the gorgeous interface. If the people behind Lift can keep things going, long-term, I can see myself using it for a long, long time. You can get lift in the App Store for free here. Pick it up, and support them.